Floods And Mold, They Go Hand in Hand! 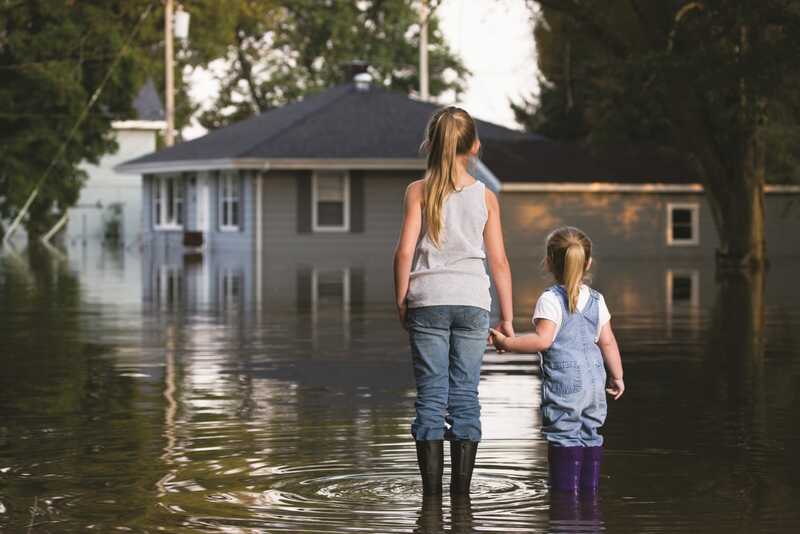 It’s important to know what to do in the case you have a flood or water intrusion in your home due to a catastrophe, natural disaster, or simply a very heavy rainfall that causes flooding. The impact of flooding may include water damage to your property, home or business. Along with water damage, mold can also occur if the water is not properly removed and your structure is not dried properly. Water damage and mold can affect the structural integrity of your building but it can affect the health of the occupants as well. Mold grows rapidly in damp and humid environments, therefore a flood is the perfect condition for microbial growth and it can prove difficult to remove. Mold may begin to grow as soon as 24 hours under the right condition so it’s important to act quickly before it gets out of control. Simply put the faster you react to the water damage the less damage will occur. Mold needs food to grow and will prefer to grow on items and materials that are porous; as an example wood structures, clothing, upholstery and carpet. It’s imperative to dry these materials as quickly as possible when flooding occurs. Indeed some materials may well need to be removed if they are damaged as well as to stave off Mould growth. IF YOU ARE IN THE MIDST OF A FLOOD OR WATER INTRUSION CALL OTTAWA’S #1 MOLD REMOVAL AND WATER DAMAGE SPECIALISTS. AT OTTAWA MOLD REMOVAL, WE CAN HAVE AN EMERGENCY WATER DAMAGE RESTORATION TEAM ON SITE WITHIN AN HOUR TO COMMENCE THE STRUCTURAL DRYING AND WATER EXTRACTION. WE CAN REMOVE THE WATER DAMAGED MATERIALS AND HAVE THE DRYING EQUIPMENT INSTALLED RIGHT WAY, BEFORE YOU HAVE MOLD GROWTH. HOW WOULD I KNOW IF I HAVE A MOLD ISSUE? When detecting a mold issues, one of the best tools for the job are you eyes and nose. If something appears to look like mould, or if you smell an “earthy” dirt like smell you can safely assume that a mold issue exists. This odour is usually an MVOC which is a digestive gas that mold gives off when present. Mold will also often appear as a discoloration on surface materials of building structural components, materials as well as furnishings. You may also notice higher moisture in the air (relative humidity) and odours that are unusual in your home. ARE MOLD SPORES SOMETHING I SHOULD BE CONCERNED WITH? Mold can germinate and grow in moist, high humidity environments very rapidly, therefore it is very important to deal with mold as soon as it’s discovered. If you prolong the mold treatment, it will extend and spread to other area’s of your home or business. Mold inside homes and buildings can trigger allergic reactions in your body. Some other symptoms of exposure to mold may include sinus and nasal congestion, wheezing, cough, sore throat and eye irritations. If you experience any of these symptoms, we highly recommend that you see your health professional as soon as you can. SHOULD I CLEAN THE MOLD OR WATER DAMAGE UP MYSELF? When dealing with any water damage repair or mold removal it’s always best to leave it to a certified professional. Restoration companies have the best training, the experience and the proper equipment to ensure that all work is done safely, quickly and preventing any environmental pollution in your home. After flooding, mould can grow quickly and spread throughout your home through your HVAC system and in the air. During a flooding event, it is highly advised to not be present in the home as it is not safe for you, your children and your pets. The best course of action is to call a professional water damage and mold specialist like Ottawa Mold Removal so that the problem is contained and remediated without further contamination of your clean items and areas in the home. WHAT DOES IT COST? WILL IT BE EXPENSIVE? The truth is flood damage can get expensive, however the longer you delay dealing with the damage, the costs will rise dramatically. The issue and damage will not disappear. In many cases, your home insurance policy will cover the damages caused by the flood and water intrusion. Ottawa Mold Removal deals directly with your insurance carrier so that you don’t need to. This will save time during the process and streamline things.